Earlier This Week Huawei launched its brand new flagship in Paris, the P30 Pro. After using it for a few days, we’re already starting to form some opinions. Just after the cold, hard numbers? No problem. Being a Huawei phone, the standout feature is the camera. We’re not sure if it’s witchcraft or just the fact that the Leica partnership is going strong, but this thing continues to impress beyond belief. We have a more comprehensive hands on regarding the camera right here, but the biggest stand outs for the P30 Pro include the ridiculous zoom and new Night Mode. I casually tested this out at a Childish Gambino concert in Paris. And for comparison, this is 5x zoom vs 10x zoom on Shirtless Donald Glover. While it was difficult to get a good shot in 10x zoom, mostly because Donald Glover barely stays still – the 5x shots were quite impressive. Alternatively, if you’re someone who prefers to just point and shoot on auto, you’re going to be more than happy with the Pro. Here are some examples from Versailles. And the above is another example of auto vs 5x. Huawei has made a name for itself by releasing the best phone cameras of the year. Each improvement seems almost effortless. Even revolutionary features are added in a way that feels like the embodiment of a shrug and a casual “but of course”. And it looks like 2019 is no different. The ability to see in the dark? But of course. 50x zoom. But. Of. Course. We are yet to do a more clinical battery run down test, but from a anecdotal perspective the battery is excellent. Coming in at 4,200mAh, the P30 Pro is pegged to have a two-day battery life. While that will be dependent on how much of a flogging you give it, I’ve certainly been happy so far. On the first day of use it was off charge between 8am and 6pm and had only dropped by about 40 per cent. During that time I was mostly using it for photography, light browsing, some social and about an hour of hot spotting to my laptop. Compared to the Samsung S10 Plus and iPhone XS Max, the P30 Pro is definitely a cut above. The camera and battery may continue to go from strength to strength with the P-series, but the same can’t be said about whats going on under the hood. Don’t get me wrong, it’s not bad at all. It’s just that the incremental nature of these upgrades isn’t much to get excited about. The 6GB RAM/128GB storage we saw in the P20 Pro has now been bumped up to 8GB and 256GB. Its also sporting the same Kirin 980 processor that was in last year’s Mate 20 Pro. And to be fair, that was always going to happen. We were never going to see another upgrade here, at least until the Mate 30 series. All in all, everything still works great here – but you’re probably not going to notice a whole lot of performance or speed difference. While the zoom capabilities are impressive on this thing, that doesn’t always work out in practice. Stabilisation can become a real issue, especially when you start jumping between the 10x and 50x. While I have seen some magnificent photos come out of zooming in that far, I have found that it’s not an easy task. One of the problems with having such beautiful reflective exterior is that it only stays that way for about three minutes. My beautiful ‘Breathing Crystal’ unit is now covered in grubby fingerprint marks that only strengthen the argument that I should put a case on as soon as possible – even if it means covering up the lovely shade. Another issue with the exterior is the rather long scratch that has already manifested on the screen. 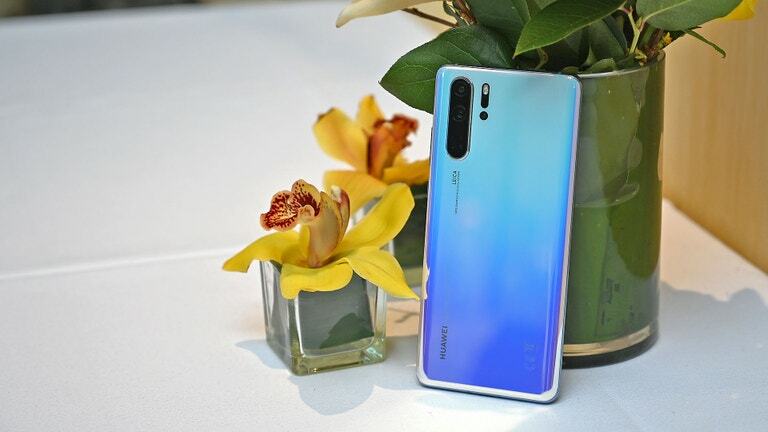 This week Huawei’s P30 series launched in Paris. Packed with a stunning camera, as well as an epic two day battery life, the Pro in particular has already set itself up to be a contender for the best smart phone of the year. It didn’t take long for the telcos to start dropping their plans for Huawei’s new flagship, and we have them all right here for you. At the time of writing the biggest beating that the phone had taken was being stored in my pack pocked for the most part. I hadn’t thrown it into a bag of any sort, and the only other places it has lived is on the surface of tables and a hotel bed. I found it interesting that Gorilla Glass wasn’t mentioned as an inclusion for the P30 Pro, and now I can see why. Despite the fact that I have a pre-launch version of the phone (which can have some differences to the versions customers can buy), I would highly recommend throwing a screen protector on this bad boy immediately. While I will need to spend a bit more time with this to test out the biometrics properly – I’ve found facial recognition to be a bit hit and miss. It definitely struggles in low light, and didn’t work for me at all in the dark. Again, journalists didn’t get final-software units, so the ones in stores may be a little better – but we have no way to verify that as yet. I know, I know. This is a personal thing and outs me as an old woman yelling at the cloud. But when wireless headphones and buds alike continue to be pricey, I will still clutch to my love of wired sound receptacles. Until every non-headphone-jack phone comes with a decent set of wireless buds, I’ll continue to advocate for the jack. The Huawei P30 Pro will set you back $1,599 in Australia, with the P30 coming in at $1,099. Both are available for pre-order now in Breathing Crystal and Aurora and will hit stores on April 16. If you pre-order before April 15 you’re eligible to score a free Sonos One. Keep your eyes peeled in the coming weeks for our comprehensive review.